If doing what you’ve always done is not giving you the results you seek, it’s time to do something different. Finding Love is a treasure trove of useful information for those looking for love again – whether through divorce, separation or loss. Practical tips and information for singles with guidance from relationship experts, real-life interviews and case studies, and self-reflection exercises. Choosing your next partner is an important decision – the rewards of making it a good decision are tremendous. You’ll learn what Critical and Negotiable Personal Values are, why these are just as important as physical attraction when choosing your partner, and why we so often get this wrong. Martinez has a knack for telling compelling stories through a combination of exceptionally clear writing and good journalism. The parallels drawn from relationship theory to the experiences in the stories told by men and women – some of them partners – make for riveting reading. The self-reflection exercises help you discover your own values and round off what is a truly thought-provoking, engaging and current look at dating today. You will be inspired that it is possible to love again. 5.0 out of 5 starsYou Can Do It! When I found myself turning 50 years old, with a newly broken marriage, heartbroken and fearful of the future I had to find my own way – through the pain and on to date again. One of the hardest things to cope with was the nay-saying of others “at your age you’ll never met anyone”, “the only good single men are gay”, “you’ll have to reconcile yourself to being alone now”. It was hard to move part this, let alone start dating again at mid-age. I had to find my own way into dating in my 50s. I looked for resources and found almost nothing, despite the fact that many, many people are starting to date again in their 40s, 50s, 60s and beyond. I was overjoyed to read Carolyn Martinez’s Finding Love and wish fervently that it had been published back when I was looking for a way through the heartbreak and back into the dating game. It is practical, full of wonderful self-reflection exercises and most importantly Carolyn’s ‘you-can-do-it’ approach. She is like a wonderful dating coach. She believes you will fall in love again and her positivity is absolutely uplifting. My favourite part of the book is the self-reflection exercises. These are valuable tools for evaluating the lessons you have learned so far, the wisdom you have gained and seeing how you can apply these to your next relationship. There will be another relationship! If you doubt this, or you are single – and don’t want to be - this is the book for you. There's a lot of wisdom to be gained from Finding Love again. As someone who has been in numerous broken relationships, Finding Love Again has given me renewed hope in finding the right person. It's given me insight into why my past relationships didn't work as well as guidance on what to look for going forward. Carolyn Martinez has a knack for taking sensitive painful subjects and, through a combination of exceptionally clear writing and good journalism, making them seem both natural and surmountable. Her previous book, Inspiring IVF Stories was a clear eyed and anecdotally rich resource for people wanting to navigate around the often complex world of IVF. Martinez’ new book, Finding Love Again, is another book full of stories about people who have attempted to develop another relationship after at least one long-term one has ended. Though the stories are presented without too much editorial interruption, Martinez provides a kind of cumulative wisdom as the book progresses, building up to practical tips to go along with such a wealth of anecdotal advice that it’s hard not to feel like it’s entirely possible to find true love, at any age, no matter how badly a previous relationship has failed. The book explores both positive and negative relationships, uncovering pitfalls, common errors, and reasons why relationships do and don’t work in order to uncover what it takes to build a relationship that has harmony and longevity. Though the majority of the book is built around stories, the case studies are bolstered by an opening interview with relationship educator Robyn Donnelly, and Martinez’ own extensive research. It’s quite interesting to see the connection between real-life behavior/patterns and theory. Each story ends with a discussion and set of dot points by Martinez, teasing out the key learning from the story, along with a final summary of what works, and what doesn’t in terms of longevity and happiness. There are twenty-one stories in all – each completely different. Some involve a very smooth transition from one relationship to the next, with relatively little pain, while others involve tremendous difficulties—some tragic, some involving multiple unhappy relationships, breakups, losses and bad dates. Ages vary too, spanning a range from thirty something to seventy something. The stories are sometimes told from both partners’ points of view – as was the case with Inspiring IVF Stories, which also adds to the depth and sense of perspective. All of the stories are told with sympathy and a great deal of honesty, in the storyteller’s own voice, and with a lot of analysis of the mistakes they made. Not all of the stories are happy ones. Some end up unresolved, but with perhaps a newfound sense of self and perspective. Though I didn’t warm to every interviewee, many stories are quite moving. I was particularly moved by Andrea’s story. In a follow-up letter nine months after her initial interview, Andrea remarks on Martinez’ mode of narrative: “but to hold it in this sacred space of empathy, understanding and kindness, and then to tell it…” This is what Martinez does throughout the book. Finding Love Again is a valuable manual on how to ensure that a second relationship is sustainable, but it is also a series of stories told with empathy. Even if you aren’t looking for love, there are lessons to be learned here. The book finishes with seven self-reflection exercises, tips for combating loneliness, and a toolkit for assessing your own personal values – a common theme throughout the book. As for me, while it’s true that I’m now going into the twenty-sixth year of my first marriage, there are still lessons to be learned in Finding Love Again about give-and-take, about maintaining a sense of newness and care in the face of the daily grind, and about paying attention to the other person in the face of all of life’s distractions, especially if you’re juggling family, work and all-encompassing hobbies, as we all are. 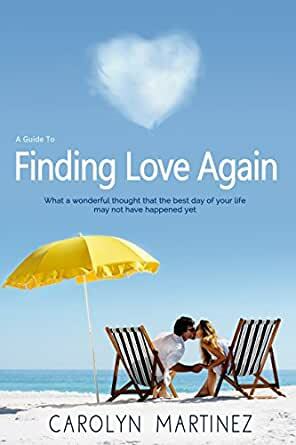 Finding Love Again, is a well-written, sensitive and very easy to read book full of stories, ideas, and advice on how to find love, and more importantly I think, how to keep love strong for the duration. 5.0 out of 5 starsHope. Finding Love gives you hope. Hope is a powerful entity, and being able to show support to those whose hope has faltered is a remarkable thing. Carolyn Martinez has written a real and honest book, sharing real experiences about real people about this thing we all know as love. Martinez’s style of writing is wise and inspirational, and gives her beloved audience members the opportunity to think and consider their own personal journeys, to relate to other people, and to show they are not alone. Since reading this book I have been motivated into finding love again and this is after being single for over 10 years. I’ve already been on two dates and have totally changed my approach to dating. I now feel rejuvenated and know that at 53 I am going to find love again.. Thanks for writing this Carolyn, educational and entertaining, I am already recommending it to all and sundry. All the best to you and hope that you continue to inspire others.